Explosive in both its pace and its revelations, The Third Secret is a remarkable international thriller. Bestselling author Steve Berry tackles some of the most controversial ideas of our time in a breakneck journey through the history of the Church and the future of religion. Fatima, Portugal, 1917: The Virgin Mary appears to three peasant children, sharing with them three secrets, two of which are soon revealed to the world. 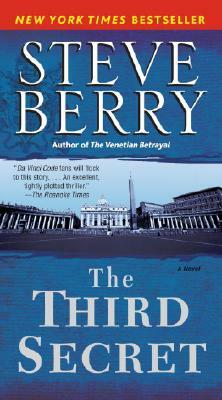 The third secret is sealed away in the Vatican, read only by popes, and not disclosed until the year 2000. When revealed, its quizzical tone and anticlimactic nature leave many faithful wondering if the Church has truly unveiled all of the Virgin Mary’s words–or if a message far more important has been left in the shadows. Vatican City, present day: Papal secretary Father Colin Michener is concerned for the Pope. Night after restless night, Pope Clement XV enters the Vatican’s Riserva, the special archive open only to popes, where the Church’s most clandestine and controversial documents are stored. Though unsure of the details, Michener knows that the Pope’s distress stems from the revelations of Fatima. Equally concerned, but not out of any sense of compassion, is Alberto Cardinal Valendrea, the Vatican’s Secretary of State,. Valendrea desperately covets the papacy, having narrowly lost out to Clement at the last conclave. Now the Pope’s interest in Fatima threatens to uncover a shocking ancient truth that Valendrea has kept to himself for many years. When Pope Clement sends Michener to the Romanian highlands, then to a Bosnian holy site, in search of a priest–possibly one of the last people on Earth who knows Mary’s true message–a perilous set of events unfolds. Michener finds himself embroiled in murder, suspicion, suicide, deceit, and his forbidden passion for a beloved woman. In a desperate search for answers, he travels to Pope Clement’s birthplace in Germany, where he learns that the third secret of Fatima may dictate the very fate of the Church–a fate now lying in Michener’s own hands.